Tuesday, May 27 @ 3pm - Onaway Center. 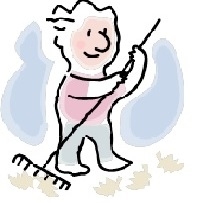 Spring is here and with it brings all the chores that have piled up through the winter: raking, yard clean-up, gardening and spring cleaning. Join therapists Teresa Duncan and Arika Kunath from Thunder Bay Therapy and Sports Medicine of Alpena and Rogers City at the Onaway Center this coming Tuesday, May 27 at 3:00 pm. Good body mechanics is the key to injury prevention!